TYPE: Non-fiction (science, philosophy), theory. 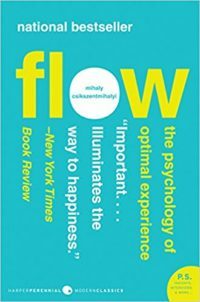 SYNOPSIS: A bottom-up guide to finding success, growth and happiness through flow – an optimal experience of being, characterised by total absorption and joy in the present moment – by psychology professor, Mihaly Csikszentmihalyi [Me-high Cheek-sent-me-high]. NOTE: Happiness isn’t pleasure. Happiness is flow: a state of optimal experience; a state of joy, creativity and total involvement in which problems seem to disappear and there is an exhilarating feeling of self-transcendence and control. If you’ve felt hours fly by like moments, held a lover in your arms or marvelled at a sunrise you’ve experienced flow. In fact, it’s a state we experience surprisingly often, at work, at home and at play. But flow isn’t just something that happens to us, it’s something we can engineer. Something we can get better and better at, no matter what we’re doing, who we’re with or what life throws our way. The Making of Meaning – Finding universal flow and finding peace through meaning. Anxiety – disquiet when things are too hard, unclear or caused by chronic dissatisfaction. Keep raising the stakes – live in crescendo and ensure that your goals always stretch and inspire you. The reward? A joyous absorption in the now; a loss of self-consciousness, a state where time is altered and all but the present falls away. A state, in fact, that sounds suspiciously like traditional accounts of ‘enlightenment’. Such experiences are autotelic – an end in themselves, without thought of growth or reward. And yet, they create the perfect conditions for both growth and reward. “For success, like happiness, cannot be pursued; it must ensue, and it only does so as the unintended side-effect of one’s personal dedication to a cause greater than oneself or as the by-product of one’s surrender to a person other than oneself. Happiness must happen, and the same holds for success: you have to let it happen by not caring about it.” – Viktor Frankl, Man’s Search for Meaning (crunch). But creating flow, not just at play, but in every part of your life, isn’t always simple. And it definitely isn’t easy. Yet it’s here that Flow really excels – in its bottom-up approach to a problem that has troubled thinkers for thousands of years. Because, as Csikszentmihalyi’s reminds us, flow isn’t just a fleeting and foreign sensation. It’s not the exclusive domain of masters, philosophers and yogis. It’s something we can all point to in our lives. And the trick isn’t to try and magically flow everywhere, all at once. It’s to methodically master its workings across each domain of our lives – beginning with the games, sports and hobbies we love, passing through learning, work and our relationships with others and ending in our attitude to life’s inevitable setbacks and challenges. Happiness, it transpires, isn’t a state or a noun, it’s a verb. And it’s in mastering our attention, our ability to set goals, seek feedback, keep challenging ourselves and find joy in the present moment; it’s in deepening and connecting flow at work, at play, at home and in the face of adversity that we find peace and enlightenment. It’s from the bottom-up that we turn flow from fleeting and random into an ongoing act that saturates the whole of our lives. Mastering flow allows us to create flow no matter what we are doing. And, when we link all those experiences together, it creates a life of happiness. It gives us a way to transcend ourselves and flourish no matter what comes our way.